Princess Prin, a snowy white cat, and Prince Kotaro are the inspiration or cat muses mews-es for the Japanese designer, Takako Iwasa. 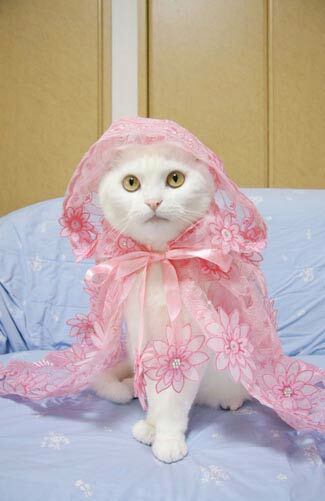 The cats are poised to become the supermodels of kitty couture in the new book Fashion Cats by Takako Iwasa. They are photographed in the "latest" kitty fashions. You can purchase Iwasa's designs online, where the designer or Prim Mama as she is known, sells everything from young lady blouses to rabbit hats for your kitty. Read the designer's interview with Vice on how she got the idea to create couture for cats. Now that is mighty fancy fur sure! WOW!! That IS high fashion !!! Um...I think this should come with a "do not try this at home" warning. MOL...I wouldn't dare try dressing my kitties because claws and skin just don't go well together! We know Daisy, too ... she and Harley are very talented models! So cute!! That elegant pink outfit is perfect for the white coat of Princess Prin! I love the wig, too...it's just too cute!